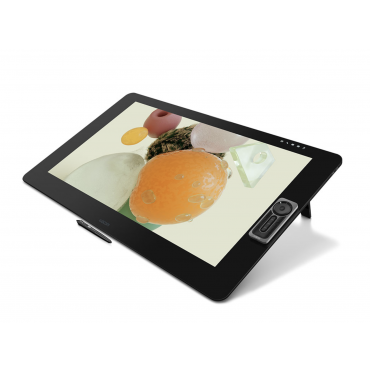 - The etched glass screen provides a distinct, tactile experience as you draw, mimicking the feel of a pen on paper. - And with minimised parallax, and a screen strong enough to resist ‘pooling’ and rippling, each mark appears precisely where you expect it, every time. - As a creative professional, time’s rarely on your side. That’s why Wacom Cintiq Pro puts productivity solutions right at your fingertips. - Connect to any Mac or PC with a single USB-C cable (included) to a USB-C port for both video and data. DisplayPort or HDMI are also included, which require USB port for data. - The ExpressKey™ Remote puts 17 programmable buttons within easy reach. The on-screen keypad and the radial menus offer further one-touch shortcuts. - Pan, zoom or rotate your work with multi-touch gestures - as simple as using your smartphone.